3 or more bonus symbols trigger the feature with up to 100 free spins and the possibility of retriggering additional free spins whilst in the feature round. Best of all, both in the feature and in the base game play, gorilla symbols pay right to left, in addition to standard left to right for more chances to line up high symbol wins on every spin! Try this 5-reel slot that features large symbols now and you’ll enjoy highly detailed reel symbols and a clumped high symbol that gives you a greater chance at winning a higher award! And remember, when you play Amazon Queen™ or any of our exciting games at Jackpot Party® Casino, you could trigger the Jackpot Party Progressive™ bonus – the only progressive jackpot in the world that can be won on any game, with any stake and at any time – completely at random! 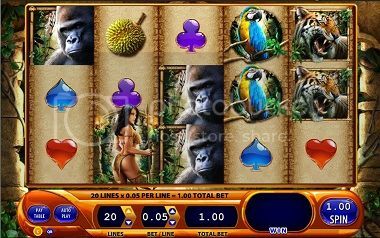 So go wild and Play WMS Slots Online today available online at Jackpot Party® Casino. What a cool looking game. I wish US could at least play at Jackpot Party, they seem to have some great slots!